Live up to your inner explorer! Your journey will take you to Mikumi and Udzungwa Mountains National Park. Less crowded and unspoiled, immerse yourself with all the sensations of a true wilderness adventure. Travel through the vast savanna, viewing the favorite creatures of wildlife enthusiasts and trek through the thick forests of the mountain. Dare to venture out and witness new sights, extraordinarily different from your usual safari. 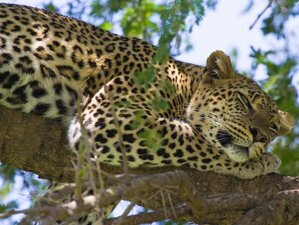 During this safari, you will be staying in various accommodations across Tanzania. For the first and second nights, you can have some well-earned rest at Mikumi Bush Camp. For the third night of your safari, you can relax at Twiga Hotel and prepare for your departure for the next day. You will depart from Dar es Salaam at 8:00 a.m. to arrive at Mikumi National Park with your picnic lunch. Enjoy a sunset game viewing in the park. Animals commonly found there include the lion, eland, hartebeest, buffalo, wildebeest, giraffe, zebra, hippo, and elephant. Wild dogs can also be seen in packs. Enjoy your dinner and overnight stay at Mikumi Bush Camp. In the morning after breakfast, you will have a full-day game viewing in the park. The Mikumi flood plain is the main feature of the park along with the bordering mountain ranges. The Mikumi elephants are mainly grazers and do not cause tree damage. Have a hearty evening meal and retreat to your accommodations at Mikumi Bush Camp. On the third day of your safari, have a morning game viewing in the park. Mikumi’s vegetation includes woodland, swamp, and grassland with two water holes, Mkata and Chamgore. Apart from the saddle-bill stork, hammerkop, and malachite kingfisher, you will also find the monitor lizard and a deadly python inhabits the pools. You will return to the camp for brunch afterwards. In the afternoon, drive to Udzungwa Mountains National Park for dinner and your overnight stay at the Twiga Hotel. After breakfast, start the trekking that leads to the spectacular trail up to Sanje Waterfalls. From there, you will have a view of Kilombero Valley from 180 meters. Return to the lodge for lunch afterwards. In the afternoon, you will drive back to Dar es Salaam. On the last day of your safari, you will trek through Udzungwa Mountains National Park to reach the lovely Sanje Waterfalls and witness the stunning view of Kilombero Valley. This safari will take place in Mikumi and Udzungwa Mountains National Park in Tanzania. Mikumi National Park is located in southern Tanzania in Morogoro Region about 320 kilometers from Dar es Salaam. Udzungwa Mountains National Park is located about 65 kilometers away southwest of Mikumi National Park. During this safari, your daily meals will be provided by Selous Ngalawa Camp as per the itinerary. You will also be provided with drinking water while on safari. Please book your flight to arrive at Julius Nyerere International Airport (DAR). Transfer from and to the airport is included Selous Ngalawa Camp will pick you up from the airport.